Job previews that target candidates and improve your recruitment efficiency. Logi-Serve’s Realistic Job Preview enriches standard job postings with an interactive preview of open positions. Educate job-seekers, pre-screen candidates, and inform your recruiting strategies. Target ideal candidates and improve your recruiting. Logi-Serve’s Realistic Job Preview pre-screens potential applicants through an enjoyable multimedia job exploration activity. Use it to improve job fit among your applicants or to onboard newly hired employees. Today’s candidates are on the go and always connected. The Realistic Job Preview is optimized to work across all device types. It’s convenient to access and easy to use. The iRJP uses employee testimonials to showcase how incumbents experience the job and the organization's culture, as well as illustrate career growth paths and potential. Through sample stories of job success, such testimonials drive job interest and excitement. Research has identified what candidates most want to learn about new job positions. The iRJP arranges these elements into relevant "job zones" that job seekers can explore. The employer uses these job zones to set accurate job expectations, helping the candidate make a more informed decision on whether to apply, increasing job fit and lowering short-term turnover. The Logi-Serve interactive Realistic Job Preview is made to-order using our proprietary platform consisting of interactive, multimedia friendly templates. The iRJP's multi-media design propels job seekers through an engaging learning activity that informs them about the organization, its culture, and your employee value proposition. The IRJP elicits feedback from job-seekers to what they have learned, encouraging them to reflect on the relevant job information, and providing you with insight into their attitudes toward, and fit for, the position. This activity fosters realistic expectations about the job and the organization, ultimately promoting employee satisfaction, trust, and longevity. The back-end reporting engine generates recruiting insight in areas such as sourcing effectiveness, job seeker perceptions of the position, and job seeker position fit. The Realistic Job Preview serves as a key source of intelligence for enhancing sourcing, recruiting and recruiting marketing efforts. Logi-Serve products are cloud-based, running effectively on any operating system and browser. Furthermore, our flexible and responsive product design optimizes every user's experience, ensuring job seekers can access Logi-Serve products anywhere in the world and on any device of their choosing. Educate, inform, and attract top candidates. 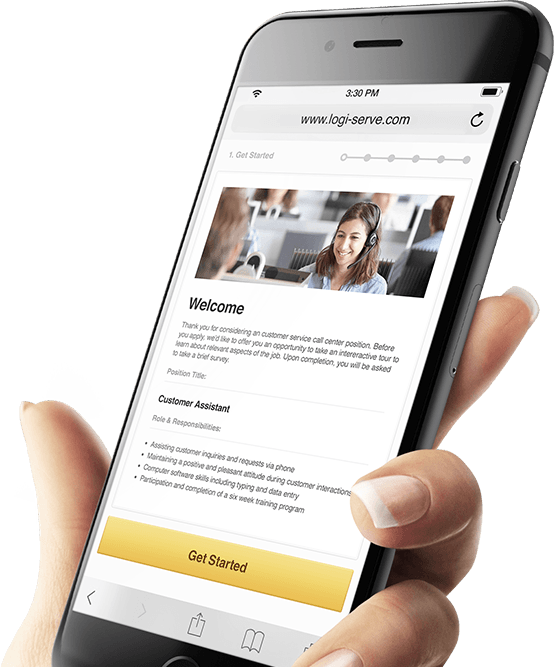 The Logi-Serve Realistic Job Preview is an easy-to-use survey and interactive realistic job preview activity designed to inform job seekers and pre-screen potential applicants or onboard new hires. Enhance standard job postings with an enjoyable day-in-the-life preview of open positions to find your best match. The interactive Realistic Job Preview combines best-in-class job science, candidate to job matching algorithms, and interactive multimedia to educate, inform, and screen potential job candidates before or after they apply. Apply to all job postings within your organization, regardless of position type. The Realistic Job Preview is tailored to every client’s specific needs to provide the most accurate depiction of available positions. The interactive Realistic Job Preview is optimized to work across all devices. It’s quick, convenient, and easy to use. The interactive Realistic Job Preview is based on research into what factors drive a candidate’s interest in a job and organization. These factors are organized into “Job Zones” that candidates explore interactively. The interactive Realistic Job Preview informs and educates with a realistic preview of requirements, company culture, technology use, and promotion opportunities. Rooted in behavioral science, job previews help job seekers self-evaluate by setting accurate expectations of job requirements, producing a better fit and reducing turnover. As an on-boarding aid, they provide new hires with specific information they’ll need to know to get started and hit the ground running. The interactive Realistic Job Preview collects relevant data throughout the candidate experience. Employers can study and review this data to inform decisions on recruiting and on-boarding strategies. Our Interactive Realistic Job Preview informs job seekers of your organization’s mission, values, and culture in a visually rich, interactive context. It enhances your employer brand not just through the messages it shares but by the manner in which it does so – demonstrating the importance you place on educating job seekers and fostering job fit. The Interactive Realistic Job Preview is designed to excite job seekers who are a good fit for the position, while encouraging others to self-select out. The result: A pipeline of candidates who are better informed and more likely to stay in the job longer and succeed. New hires who experience the Interactive Job Experience Preview start their job tenure much more knowledgeable about the position and your organization. Informed candidates are much better prepared to contribute value from day one. The data captured in the job preview provides recruiters with a revealing view of job seekers’ attitudes toward the role. Armed with these insights, recruiters can refine marketing, sourcing and recruiting strategies. Research shows that fostering a positive candidate experience helps shape brand perception and increases a role’s appeal. Realistic job previews help job seekers maintain accurate expectations of job requirements. They, in turn, produce a better job fit, which cuts short-term turnover. A Fortune 50 client reported 33 percent reduction in short term turnover. Geoff Barlow Vice President, Talent Acquisition, Express Scripts We’ve seen a 33% reduction in short term turnover by using the Logi-Serve interactive realistic job preview. John Leech Director of Talent Acquisition, St. Jude Children’s Research Hospital The iRJP provides actionable analytics data on applicant fit, candidate intentions and job attraction with insights that directly tie to effective recruiting. Kris Johnson VP, Fitness, In-Shape Health Clubs Logi-Serve is a critical, proven tool that predicts job fit, increases sales conversion and improved customer satisfaction rates.